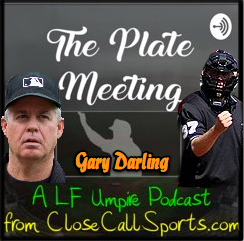 To celebrate the spirit of Thanksgiving, we're chatting with 26-year MLB umpire and UMPS CARE Charities President Gary Darling about baseball, charity, and more—and we'll be releasing daily snippets or teasers for Episode 7 of the Plate Meeting Podcast on our social media accounts from now until the episode's release date on Monday, November 26, 2018. We begin with a pre-Thanksgiving feast, in reverse, kind of, with Gary's infamous gum spitting ejection of Red Sox Manager Bobby Valentine on May 18, 2012. And be sure to follow us on Twitter 🐦 (@UmpireEjections) and like on Facebook 👍 (/UmpireEjections) to make sure you get all the latest UEFL info and baseball news, and to grab all of our teasers for Episode 7 over the Thanksgiving weekend.